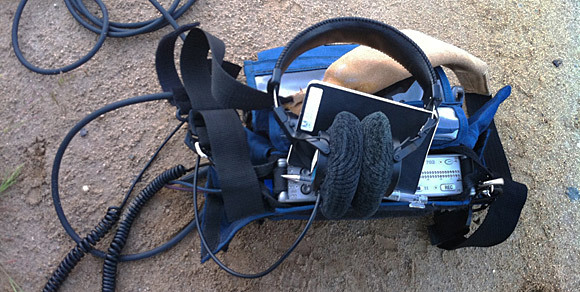 A multi-disciplinary designer’s journey in field recording, sound design, and music. 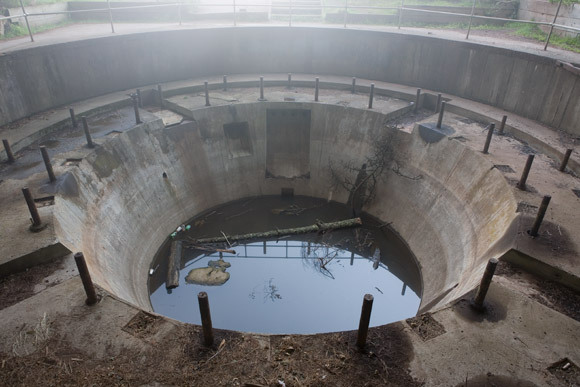 “Construction 129,” a never-completed gun emplacement overlooking the entrance of the Golden Gate, Fort Cronkhite, Marin Headlands, California. 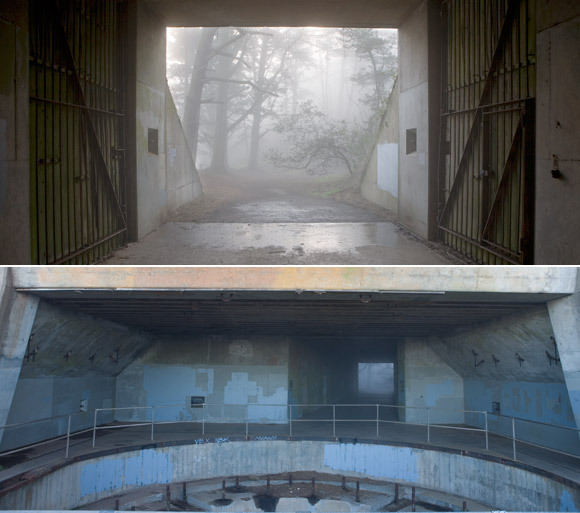 When a winter storm was forecast for the San Francisco Bay Area, I decided to head to the Marin Headlands and try my luck recording bad weather in the abandoned gun emplacements and military fortifications of Fort Cronkhite. I had previously found some great metal sounds at Fort Baker, also in the Headlands, and I was also inspired by Tim Prebble’s high-wind-sub-bass-generator post. Unfortunately for me, the storm track was slower than predicted, and I wasn’t able to record in peak wind, although some moderate rain started to fall. Such things happen, even with the best of intentions. So, what do you do when your primary plan doesn’t pan out? You reset your expectations and record what you can. I mean, c’mon, I’m in these amazingly evocative ruins! Surely there’s something that’s audibly interesting! So, I decided to record rain in the tunnels. A recent re-viewing of Ridley Scott’s Prometheus reminded me that tunnels and caverns in films often feature water drops that are drenched in heavy reverb. I pressed the “record” button in several settings and closed my eyes: Was I in the bowels of an ancient spacecraft? The Mines of Moria? The hull of a leaky, empty freighter? The gun emplacement at Construction 129. No weapon was ever installed. Occasional wind blasts forced me to enable a high pass filter at 120Hz to try to remove some of the ambient rumble that didn’t help the recording. In addition, there are no fewer than three foghorns in the Marin Headlands, so I had to make an edit every 50 seconds to eliminate the lonely bleat of the Point Bonita lighthouse horn. There is always something worth recording. You just need to let your disappointment go, reset your expectations with some beginner’s mind, and just start rolling. I was sick at home one fall day and I heard a European starling singing. Loudly. I didn’t see it outside of any doors or windows, all of which were shut anyway, and then realized that it was perched on my chimney, and therefore was singing right into my house. All my high-end nature recording mics were in my closet; nothing was hooked up and my batteries might not have been charged. So, even with oodles of gear around, I just grabbed my handheld Sony PCM-D50 that was right on my desk, and started rolling. Look carefully: Deep impact zone, short period, wind parallel to the shoreline. Not a good day for recording single waves. So...what is? It’s easy to get recordings of roaring surf – which can often just sound like constant white noise – but it can be tough to get relatively clean recordings of individual waves. I’ve found that picking a good day and place to record single wave hits are a combination of marine forecasts and location, and that the size of the waves really doesn’t matter. The only online article I’ve seen that mentions both field recording and marine forecasting has been published by Tim Prebble. In that excellent article, he describes finding gentle-surf days to record his amazing Seal Vocals SFX library. Sometimes finding those small- to moderate-swell days are sometimes the best days to record single wave crashes…but that’s not the only factor. Single-wave recording conditions are largely defined by a mix of swell, wind, and location. Never turn your back to the sea. The sea is huge, powerful, indifferent, and above all, unpredictable. Rogue and “sneaker” waves are not legends or myths: They occur regularly, anywhere in the world. Don’t let a recording session end in tragedy. A final note on technique: If you’re on a beach, angle the mic a bit more downwards than you’d think would be wise, and you’ll get nice sounds of the sand being pulled back as the breaking waves recede back into the ocean. Not always good to have in every recording, but this adds a lot more character. On a beach with fist-sized rocks, this can be especially cool! I had a recent session at a sandy beach in the Point Reyes National Seashore that exemplified some of the better (but not quite perfect) conditions that I describe above. First, the wind was blowing at 20 knots…but from the opposite direction of the beach I was on, which was backed by hills. That meant delayed wave breaks and being protected from the wind. There was a southerly swell that came right into the dumping-break beach (I can tell the period is averaging 14 seconds by looking at the waveforms of the audio! ), so it was all breaking swell and no wind-driven waves. It was a low-pressure day with a long-term clear forecast, and it wasn’t winter, when the masses of migratory birds come through Northern California. Only one swallow’s call made it into the recording. 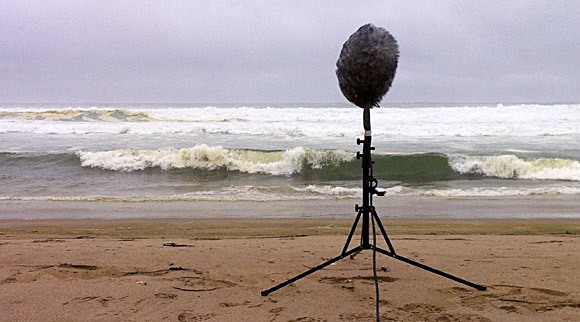 The recordings aren’t all that dramatic when you consider the breaking waves were only 3-4′ high. But listening to this loud on headphones, eyes closed, I find that the sense of scale is quite exaggerated without an accompanying visual reference…a little Waves LoAir or layering some low-frequency booms can definitely can tip it into cinematically-big breaker territory if desired. However, even in a 90-second clip, there are only three really distinct wave “claps” as the bigger waves close out at the beach. I love ravens. Not because I’m all Mr. Gothy McLordbyron, but because they’re big, majestic, smart as hell, and have gravelly voices. Like crows, but drunker. They’re the Tom Waits of the bird world. Ravens aren’t exactly rare, and perhaps because of this, they’re hard to record in the wild. They can be anywhere: Urban areas, tops of trees, windswept hills…but by the time I show up with a recorder, they’re either deciding to be quiet or are surrounded by traffic noise, intense winds, other birds, or even people. I’ve had the darnedest time capturing one cleanly. Thankfully, the ravens of Joshua Tree National Park are pretty fearless…well, they’re also always looking for snacks, and have learned that people can be a good source for tasty (dropped) morsels. I’ve noticed that they often travel in pairs or groups of less than four to six, and one day we were followed by a pair of ravens as we wandered the desert trails. The vocalizations aren’t anything super-special, but they’re (for once) pretty clean, articulate, and detailed. Just what I was hoping for! This raven was talking to his companion quietly as they spread out looking for snacks. He landed about twenty feet from me and I recorded him as he was hopping around. I like the little lilt he added at the end! Anza Borrego Desert State Park is the second largest state park in the lower 48 United States. It’s dry, as its name implies, but it’s very seismically active and has many natural hot springs and oases scattered throughout the park, so water is less scarce than you’d think. Here is one long take from this session. It starts with distant frogs, one slow croaker nearby, and then gets really hopping (ugh, sorry, I had to do it) around 1 minute in. Then, after two and a half minutes, it dies down as quickly as it started. Sierra Buttes, California: Less than 9,000' high, but the tallest thing around...with active insect soundscapes! The thing that strikes me the most about recording at high altitude is the quiet. Sounds that get masked by wind, rustling leaves of trees, traffic, and other sources become extremely articulate. Unless there are birds nearby, this usually means that insects are what comes to the ears most clearly. Atop a California mountain on a sunny summer day, I came upon a patch of blooming buckwheat that was being visited by bees and other insects. The trees were pretty far away, but cicadas were singing loudly, and the wind was pretty still. I set down my recorder and walked away for about 20 minutes to bag a nearby peak. The killer moment in this otherwise quite ambient snippet is right near the end, when a huge, fat something buzzed right past the mics. I’m assuming it’s a type of bee, but with such a deep, rumbling sound, it sounds like a cartoon or a parody of an insect sound, like something out of A Bug’s Life, as opposed to a real creature. Since I walked away during the recording, I’ll never know! I originally considered this clip an outtake from the Nature Sounds Society Field Workshop this summer (which has been previously covered in older posts). I had never seen white-faced ibises before, and their ducklike honking and loud wing flaps were mixed in with local cows that were just waking up. It was about 7am. But in listening to it again, I came to love the moment that was captured: Dense fog all around, the sun kissing vernal pools and long-grass marshland in the middle of the Sierra Nevada, and all the animals calling out to each other, re-establishing territory and familial bonds. I came to rather like the sound of the cows mixed in with the ibises, the swallows, and the blackbirds. Field recordings don’t always have to be pristine to be interesting. Sometimes you must bend your mind to the material. So, I’ll share it here today. Hang out until the very last bit, where an ibis takes off and flies overhead – great clarity in the call and the wing flaps. Lookit that man out there. He's quite a dish. One of the best reasons to spend a weekend with other sound recordists is a chance to try out new gear. A classic nature recording technique is the use of a microphone set in a parabolic dish. The general public knows of parabolics mostly from seeing people use them on the sidelines of sporting events. 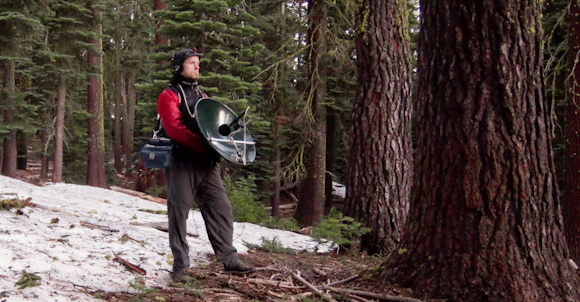 In nature recording, they’re for capturing species-specific sounds rather than ambiences. This is because the microphones in parabolic dishes are mono, and have sound pushed into them by the dish itself. This creates a very narrow “beam” of listening. Perceptually, parabolics seem like they “zoom in” on sounds, but this is simply due to such microphones just attenuating all the sounds outside that narrow cone. I got the chance to use one at the Nature Sounds Society Field Workshop. The unit you see in the photo above was the one used by the founder of the NSS, Paul Matzner, so I was holding a bit of history: Hand-made of fiberglass and aluminum, the NSS archives have lots of photos with Matzner holding this thing. Had I looked at the archives before heading into the field, I’d have gotten a way better handling technique. Holding it by its edges introduced horrendous amounts of handling noise. Today’s sound is from this unit, recorded at 5:01am at Yuba Pass, off California Route 49. As far as I can tell, this is a chestnut-backed chickadee. You can tell, even in this recording, he’s got a lot of pals around (woodpeckers and sparrows at least). Neither dirt, nor fog, nor clouds of mosquitos keeps a field recordist from his crack-of-dawn tasks! I’m finally unpacked and rested from the inspiring (and exhausting) 26th Annual Nature Sounds Society Field Workshop in California’s Sierra Nevada. Since my last post was a compilation of high-level personal experiences, I thought that I’d report back about what worked, or didn’t work, in the field on the technology side of things…as well as share a recording from our first early-morning field session. The gear list across everyone was pretty insane: many Olympus LS10 recorders, several Sound Devices 744T’s, a Sony PCM-D50, and mics from DPA, Neumann, Røde, Sennheiser, and Telinga. Recording techniques varied from mono to mid-side stereo, XY stereo, ORTF, Jecklin discs, and even two binaural dummy-head rigs (see this site for a good explanation of all this alphabet soup). An outdoor mic directionality seminar helped to illustrate what each is good for, which was a rare opportunity and extremely educational. Yeah, yeah, whatever. But what did it sound like? Today’s sound was recorded around 5:45am on a day with a slight breeze and scads of ground fog. The location was Sierra Valley, north of state route 49 in the Sierra Nevada. This recording includes at least swallows (cave or barn, I’m unsure), American bitterns, red-winged blackbirds, white-faced ibises, yellow-faced blackbirds, and a bullfrog, and certainly more that I can’t identify. [Sound Design] Field Recording Workshop 2010 from Noise Jockey on Vimeo. I’m just back from the 26th Annual Nature Sounds Society Field Workshop. I thought that I’d share some video diary entries that I shot with my new iPhone 4. As far as I know, this is the first time that video of this workshop has ever been seen online. I’ll be sharing more of the learnings, experiences, and recordings in the coming weeks. For now, I hope you enjoy this set of dispatches from the field.